Takeoff Live is the most elegantly simple, affordable digital takeoff software on the market today. No digitizer or plan prints needed... you can even use a picture of your plans from your digital camera! Takeoff Live is the most elegantly simple, affordable digital takeoff software on the market today. No digitizer or plan prints needed...you can even use a picture of your plans from your digital camera! Even if you've never used a computer before, you can use Takeoff Live. 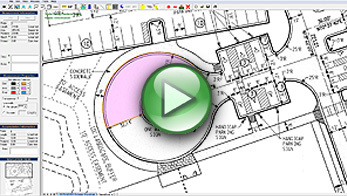 You can calculate square footage, lineal footage, and even volumes in seconds with a simple point and click. 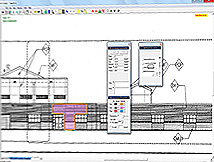 The software is intuitive, and still provides the power and flexibility you need. Go ahead, use the software for 14 days free...and of course, don't hesitate to contact us with any questions. You may also want to look at some reasons to use digital takeoff. Works on Mac via Parallels! Our Software exports to Microsoft Excel! Ideal for architects, contractors and sub-contractors, Takeoff Live is the paperless way to make your job fast, simple and hassle free. Figuring how much of any material is needed can now be done faster than ever. No matter what your trade: concrete, framing, drywall, flooring, decking, electrical, painting, plumbing, mechanical, asphalt paving, lumber, carpet, masonry, roofing, tile, piping, brick, fencing, stucco or any other construction or contractor trade, let Takeoff Live help you do it the easy way. Got a circular slab? No problem! Just trace around the arc of the circle and presto...an area and perimeter are calculated instantly. Takeoff Live can use scanned plans, plan pictures you take with your digital camera, as well as TIF, PDF, GIF, Dodge Plan files, ISQFT Plan files, Blue Book plan files, JPG, BMP, and PNG. Copyright 2014 Takeoff Live. All Rights Reserved.